The bond between Libre and the rescuer who saved the emaciated, mange-ravaged Boston terrier puppy's life is undeniable. Libre was saved from an Amish dog-breeding operation by a delivery driver on July 4. Instead of having him euthanized, Speranza Animal Rescue rushed him to Dillsburg Veterinary Center. "He's my little bug-eyed miracle boy," said Janine Guido, who runs Speranza and is adopting Libre. The bond between Libre — the emaciated, mange-ravaged Boston terrier puppy saved from an Amish dog breeder — and the rescuer who fought to give him a second chance is undeniable. "I just really connected with him. I don't know why, because I've rescued so many dogs," said Janine Guido, who founded and runs Speranza Animal Rescue in Mechanicsburg. "I get butterflies before I visit him. Something about Libre really captured my heart." Libre's reaction to seeing Guido during their daily visits leaves no doubt the feeling is mutual, according to Michelle Hall, a certified veterinary technician at Dillsburg Veterinary Center. The moment he sees Guido, Libre begins wagging his tail like crazy, and he can't wait to shower her with puppy kisses, Hall said. "I know she's going to be amazing for him — she already is," Hall said. "She's going to spoil him." Libre continues to recover at Dillsburg Veterinary Center, but assuming his improvement continues, he will be allowed to go home next week, Hall reported. And his home will be with Guido, the rescuer confirmed. "He's doing amazing," Hall said, adding Libre is drinking on his own and eating both dry and wet dog food on his own, indicating a big improvement in his condition. He is no longer receiving IV fluids, although he still does receive antibiotics through an IV, she said. "He's giving kisses, he's barking, he's running around," Hall said. "He's a dog now." Bug-eyed miracle: "He's my little bug-eyed miracle boy," Guido said. "Most dogs would have died a week before we got him. I don't know what drove him to keep fighting, but I'm so glad he did. At first I thought I'd be bringing his ashes home with me." The smitten animal rescuer also calls Libre "my cute little naked baby" and vowed to do whatever's necessary to make sure he's comfortable, happy and healthy. Hall told The York Dispatch that Guido's dedication even led her to buy tiny goggles for Libre to wear when he's outside, because his eyes are still healing. Veterinarian Dr. Ivan Pryor predicts most or even all of Libre's fur will grow back as he heals, Hall said. Pryor was recently notified he is being named veterinarian of the year by the Pennsylvania Veterinary Medical Association for his work with Libre, according to Dillsburg Veterinary Center. Libre's new zest for life also extends to meeting other dogs, according to Guido, who said he now wants to interact with his own kind. Libre is still too frail to play with other pups, she said, but soon enough he'll have a gaggle of playmates. Seven canine brothers and sisters will welcome Libre when he goes home with Guido, she said, plus a few four-legged foster siblings. The background: Four-month-old Libre was saved by a delivery truck driver who saw him a number of times over a two-month period at an Amish dog-breeding facility in Lancaster County and convinced the owners to give him the dog on July 4 so he could get help for it, according to a Lancaster Online article. The Lancaster County SPCA has declined to press charges against the breeder, spurring protests of the shelter and its leader, according to the article. The driver delivered the pup to a former humane officer, who took it to an emergency animal hospital and contacted Speranza Animal Rescue. It was Guido who named Libre, declined to have him euthanized, and instead took him to Dillsburg Veterinary Center. 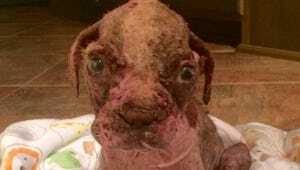 Libre was emaciated and dehydrated, suffering from demodectic mange (which is not the contagious type of mange) and secondary skin infections, according to Hall. He initially couldn't stand up on his own and had ulcers around his eyes, and a number of maggots had to be removed from his open wounds, according to Speranza. "His eyelids were so swollen he literally could not shut his eyes," Guido said, adding a veterinary ophthalmologist has told her Libre will need surgery soon on his right eye. The mites that carry demodectic mange are common on dogs, but as long as dogs are healthy they don't contract the disease, Guido said. It's generally sick or immunocompromised dogs that develop the condition, she said. Libre's odd way of walking is caused by poor muscle tone, and that too is expected to improve, Guido said. Famous: Dillsburg Veterinary Center has received hundreds of cards for Libre from well-wishers, plus gifts of dog toys and blankets, according to Hall. The center's Facebook page has noted gifts of dog food and other necessities. "He's so famous," she said. "He's definitely helping to raise awareness about puppy mills." Tens of thousands of people are monitoring Libre's recovery through social media, and hundreds of thousands have watched videos of him. "The fight has just begun for justice for Libre," Guido said. "The amount of prayers and support? It's just been incredible." Guido said she's been contacted by the Lancaster County District Attorney's Office, which she said has received quite a few letters demanding action. She said she has no doubt that without pressure from the public, that wouldn't have happened. How to help: Dillsburg Veterinary Center continues to accept donations to help offset the costs of caring for Libre. To do that, call the clinic at (717) 432-7031 or send a check to them at 8 Tristan Drive, No. 1, Dillsburg, PA 17019. "The bill just keeps getting higher and higher," Hall said. People also can donate to Speranza Animal Rescue online or through the nonprofit animal rescue's Facebook page. Search Facebook and Twitter for #justiceforlibre and #librestrong to be part of the online conversation. Hall started a Change.org petition to have Libre's breeders criminally charged. More than 30,000 people have so far signed the Justice for Libre online petition.